The velcro mesh pocket holds a face mask and turns your Guide or Expedition First Aid Pack into a SAR hasty team rescue pack. Or, simply adds another pocket to your kit. Purchase additional velcro strips to further customize your packs. Customizing note: you can cut the velcro strips to put a large loop next to medium or small loops. This is helpful if you want to put a three-inch PVC tube with a conforming bandage next to two-ounce Nalgene bottles or 58 ml Snap Top Vials with gauze or gloves. Or, one-ounce Nalgene bottles next to half- or quarter-ounce Nalgene bottles. The large 3-loop velcro strip will hold a 2-inch elastic bandage, a roll of 2-inch flexible medical tape, or a 2- or 3-inch roll of self-adhering bandage in a PVC pipe container. 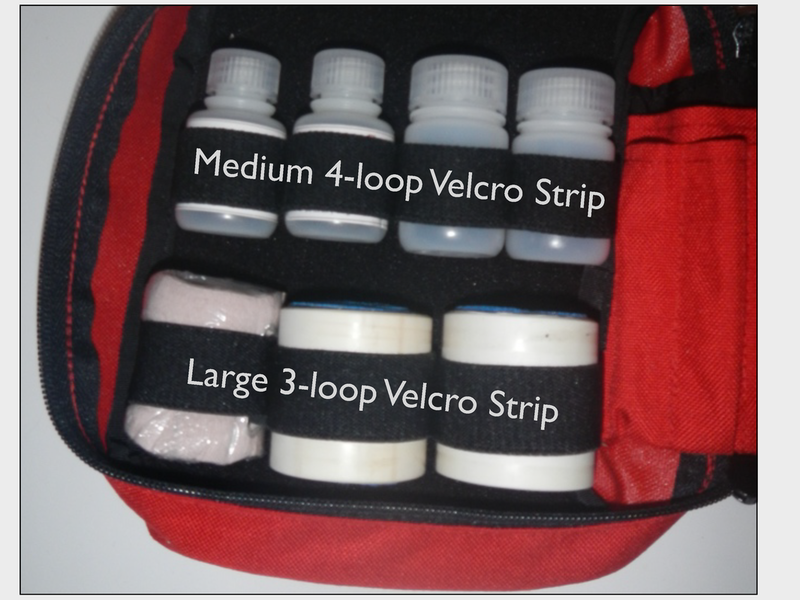 The medium 4-loop velcro strip will hold one- and two- ounce Nalgene bottles or 50 ml Snap Top Nalgene containers. The small 6-loop velcro strip will hold half- and quarter-ounce Nalgene bottles.